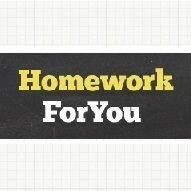 Homework Marketplace to find tutors to do your homework. While HomeworkForYou’s main business is the Marketplace, sometimes people prefer to have a trusted business handle time and quality sensitive materials. This is why HomeworkForYou also has a small team of Tutors to handle your work directly. Our prices aren’t cheap, but you get what you pay for – Timely delivered and quality assignments. Contact us at support@homeworkforyou.com to get a quote today! Lead time is usually at least 24 hours so don’t wait too long!